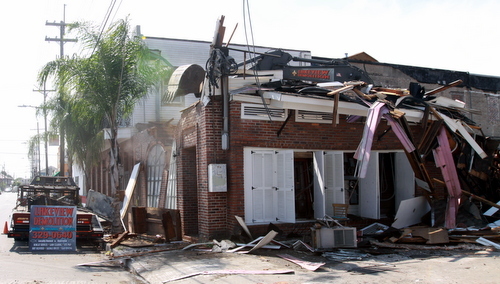 The Frank’s complex in the 4500 block of Freret was the last major undeveloped property on the corridor since a wave of new business openings began around five years ago. 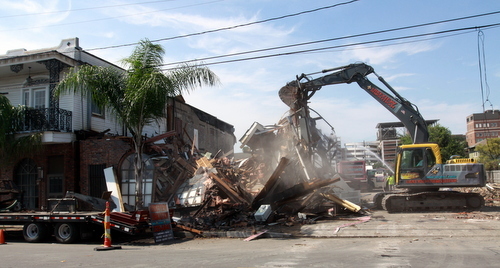 On July 2, Arnold Kirschman finalized his purchase of the buildings from the Barreca family who had owned them for the better part of a century, as part of a plan to demolish the steakhouse in the center of the block to rebuild a stretch of buildings matching the old cleaners on the corner of Cadiz. Kirschman said Thursday morning that he is still in the process of meeting with his architects, contractors, real-estate agents and city officials to hammer out a final timeline for the construction of the new buildings, which will be three-stories tall with apartments in the upper two floors. He has yet to line up any commercial tenants, he said, though he has decided to limit the project to at most only one new restaurant, so that the businesses will be the best fit to match the residents. 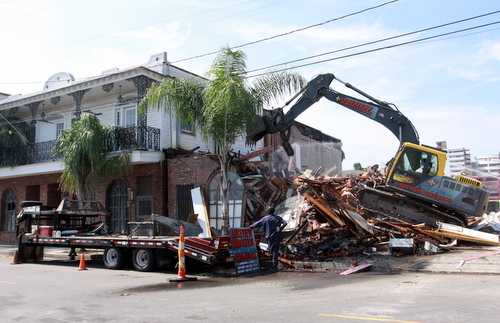 “One, there are a lot of restaurants on Freret, and two, we want to minimize any cooking odors,” Kirschman said. 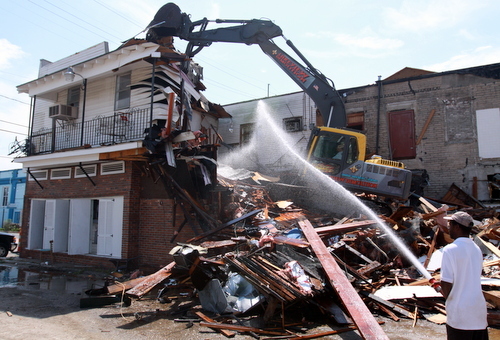 The old cleaners will not be demolished, and instead anchor the new development, and Kirschman also has no plans to tear down the two free-standing houses he owns on the block. One of them, however, may move to a different lot in the complex — but that idea too, Kirschman said, is still under consideration. “We’re trying to develop the best master plan, while at the same time we are detailing out the front buildings,” Kirschman said. 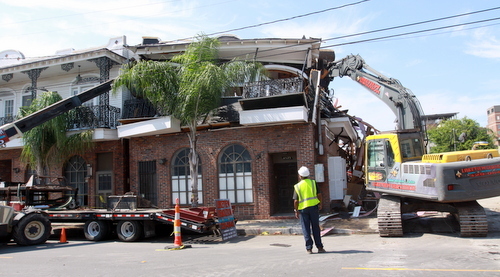 The demolition drew numerous onlookers on Thursday — some walked down to watch, while others lounged in chairs outside Rook Coffeehouse, Sarita’s Grill and the Publiq House to watch. Most cheered or applauded, either for the spectacle itself, or the notion of progress that the demolition represented to them. One onlooker, however, made no attempt to hide her tears or her pain. 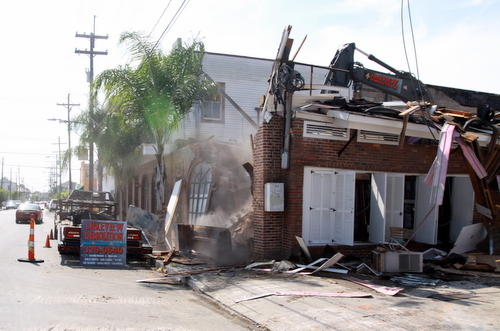 Lisa Barreca Arnoult, daughter of the late, longtime Frank’s proprietor Ignatius “Nash” Barreca, said she had gotten a text message from her brother that the demolition had begun, and needed to come see it herself. By the 1980s, the business had shifted more into catering, and it finally closed its doors altogether in the early 90s, she said. Her father had taken it over in the 1940s, when he was a Loyola student and his father — Frank Barreca, for whom the restaurant was named — had a sudden heart attack. The people on Freret Street today, she said, have forgotten or perhaps never knew what her father did for the neighborhood. 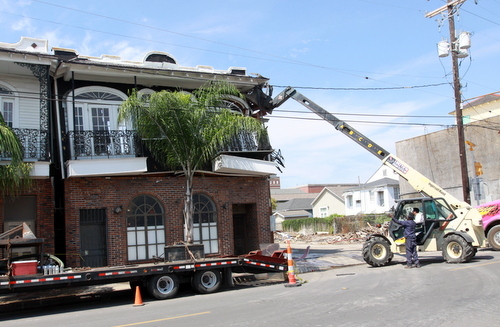 The neighborhood’s accusations that they let the buildings they owned on Freret stand fallow and blighted stung, Arnoult said, because it all would have deteriorated far faster if Nash Barreca hadn’t bought it. Until his death last year, he still visited his property every day, she said. 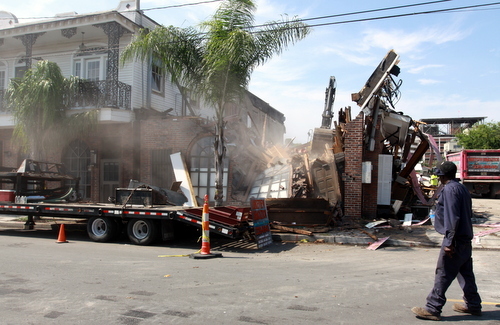 In an interview after the building came down, Kirschman said that he, too, has fond memories of Freret’s heyday. Bill Long’s bakery was in the same block (where High Hat and Ancora now operate), and Kirschman said his mother or grandmother visited every weekend to buy challah that Long was one of the few bakeries to make. The 4600 block (where Company Burger is) at that time looked similar to the 4500 block, with larger buildings closer to the street, and Singer’s Hardware store and Frank’s and Long’s made those blocks the center of commercial activity. “Everyone that talks to us shares all these memories of wedding receptions, and birthdays and all these events that went on there,” Kirschman said. Out of the Frank’s building, Kirschman said he salvaged a number of mirrored panels emblazoned with the steakhouse’s logos. 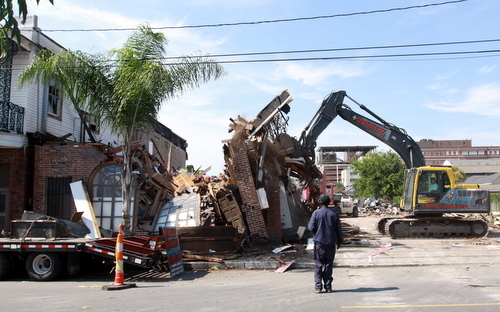 As he begins to build, he said, he is actively looking for more memorabilia and photographs so that his buildings can pay tribute to that era. As a tyke in the 60’s, I would ride in the backseat of my parent’s car as we returned home from dinner at my grandparents’ house by driving down Freret Street. I would watch the streetlights and wires go by overhead and I always noticed the sign at Frank’s Steakhouse in the form of a big, neon porterhouse steak. To me, it looked sort of like a wrinkled face and I always imagined that it was “Frank”! 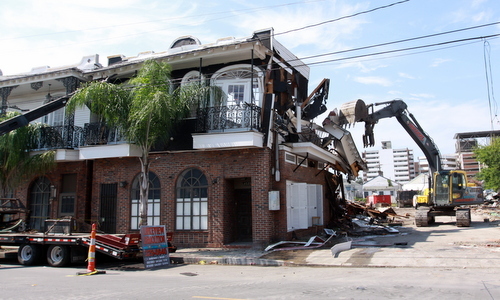 Nash was a great guy and he did try to keep Freret Street alive. 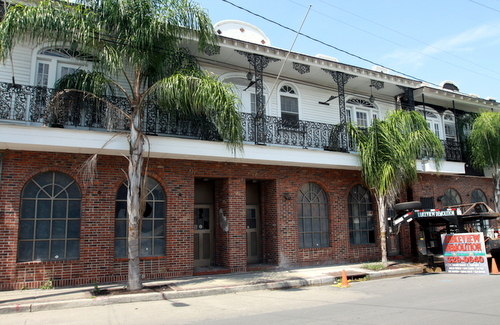 People tend to forget about how crime ridden Freret Street was back in the 80’s. And once Bill Long was murdered…the street began to rapidly decline. 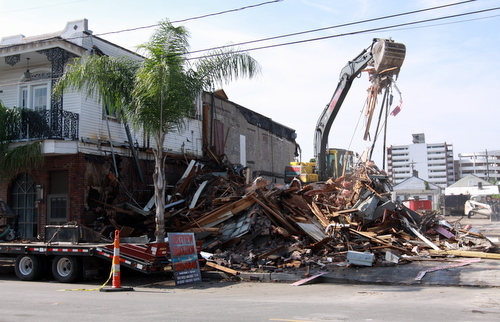 FWIW….the main reason that the street came back was the tearing down of the projects along with Katrina.